Bill Risemandeveloped a process he termed "epigrammetry" while working on material from Giza, provided in 1992 by Peter Der Manuelian, then assistant curator at the Museum of Fine Arts in Boston. Archaeological evidence came from the Western Mastaba Field behind (west of) the Great Pyramid of Cheops (Khufu), Giza, excavated intermittently between 1905 and 1932 by the American archaeologist George Reisner. The stone mastabas were constructed during the early reign of the pharaoh Cheops and continued to be built until the end of the Old Kingdom (Dynasties IV-VI, approximately 4500 years ago). The mastabas were excavated by the Americans, the Germans, and the Italians (the Italians' section later taken over by the Americans). The Merib mastaba complex, which includes Mastaba G2100, the additions G2100 Annex I, G2100 Annex II, and their burial shafts, chapels, and satellite mastabas. Merib was probably a high official of the Old Kingdom. The mastaba of Nofer (G2110), a scribe for Cheops. Riseman began by automating a number of computer techniques, including scanning the required background information, performing raster-to-vector conversions of the 2D site plan data, and then extruding that information up into the third dimension to begin building the computer models. Once the models were far enough along, texture maps could be applied, so that the surfaces of the models could simulate actual conditions. A beneficial by-product of constructing such 3D computer models is the reuniting into a single reconstruction the images of the original excavated material that has since been dispersed, some on display in museums, some in private collections, and some in storage. In other words, the original ancient site can no longer be viewed as a unified monument, except in reconstructions. Computer-generated reconstructions based on actual excavated evidence are more accurate than any other method of reconstruction, short of rebuilding the actual structures. The rendering at the left (from 1993; hover over to enlarge) shows the tomb of Nofer (G2110; Dynasty IV, ca. 2606-2575 BCE). The model was based on evidence from excavation photographs, plans, and field diary entries. The field photographs allowed us to digitally re-place the actual blocks back into their original positions and give them their original appearance, color, and texture. The color panel is a re-creation of a carving on display in the Museum of Fine Arts, Boston (museum expedition #07.1002), seen here in a simulation of its original context for the first time. The computer reconstructions illustrate the tomb in a condition close to the monument's original forms, before exposure to the elements, tourists, and vandals caused its lamentable deterioration. 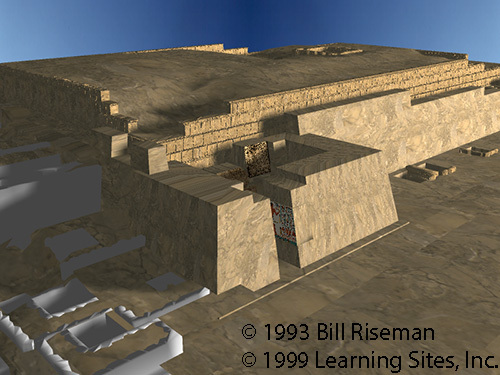 Further, Riseman demonstrated in the early 1990s that not only the elements of architecture, but also the decoration and hieroglyphics can be re-created digitally (as in the detail of the tomb of Nofer, at the left; hover over to enlarge). For example, hieroglyphics can be transcribed more accurately, more quickly, more cheaply, and made more reproducible for later study than possible by traditional methods through the use of a then pioneering technique that he called "epigrammetry" (or digital epigraphy). Epigraphy is the study of inscriptions, such as the Egyptian hieroglyphics, which occur either painted or carved in relief on walls and columns. Traditionally, and still continuing today, hieroglyphics are copied by hand using pencil or pen and ink. Computerized epigrammetric techniques using actual field photographs and autotrace computer programs have enabled us to reduce the reproduction time by as much as 90% and in some cases provide twice the accuracy. The next step was to develop 3D epigrammetric processes that will also be non-intrusive.